CHOOSING Wisely is an international campaign that encourages conversations about what tests, treatments and procedures are truly necessary. In doing so, it seeks to support a culture shift in how clinicians and consumers think about health care and complements an increasing focus on the delivery of value in health care across Australia. 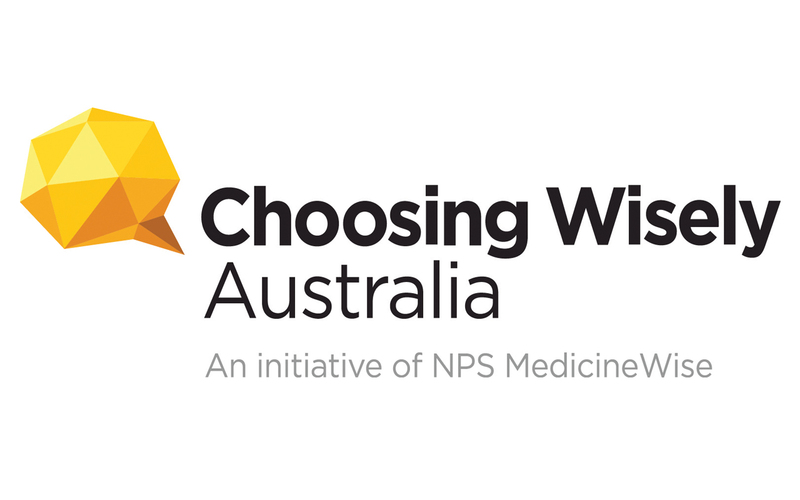 Choosing Wisely Australia, facilitated by NPS MedicineWise, launched in 2015 and boasts a multidisciplinary membership that includes physicians, GPs, physiotherapists, pharmacists and nurses. The success of Choosing Wisely to date, having spread to 20 countries, has been attributed to six core principles (Table 1) as well as a focus on professional values and the role of clinicians in resource stewardship, and on improving conversations to reduce unnecessary care. From the outset, Australian health services actively sought to engage in the campaign. NPS MedicineWise established the Choosing Wisely Australia Champion Health Services network in direct response to this energy and desire to implement Choosing Wisely activities in the hospital setting. Champion health services must have the support of executive and clinical leadership teams, agree to the core principles and commit to implementing and evaluating activities that support these principles. NPS MedicineWise provides support including communication and evaluation tools, and regular forums to share learnings. With membership continuing to grow, five original Champion Health Services — Austin Health (Victoria), Monash Health (Victoria), Royal Brisbane and Women’s Hospital (Queensland), Sir Charles Gairdner Hospital (Western Australia), and Western Australia Country Health Service (Wheatbelt) — were invited to share insights from their Choosing Wisely programs to date, in particular, to identify the key enablers for initiating activities that seek to successfully align culture shifts across their organisations. This article shares these insights alongside case scenarios that demonstrate how these organisations have approached implementation. clinical school representatives should be included on steering committees. multidisciplinary steering committee that has executive support. internal workflows and garnering support along the way. The principles of Choosing Wisely (Table 1) are as important as the Choosing Wisely recommendations themselves Clinicians are encouraged to take a leadership role broadly across quality improvement activities and not be limited to Choosing Wisely recommendations. Many sites have introduced initiatives that are not explicitly associated with Choosing Wisely recommendations but are governed by the principles; for example, projects related to specialty areas (eg, infectious diseases) or identified by local evidence of inappropriateness. Recognising and rewarding this desired behaviour across the organisation can sustain programs and help support a culture of Choosing Wisely in clinical decision making. A focus on clinician leadership and stewardship and engaging with consumers in conversations in order to reduce risks of harm and waste have been key. The established branding of Choosing Wisely and its clinical, non-financial focus have credibility with both health professionals and consumers. In addition, the concept of sustainable health systems and clinician’s role in this inherently resonate with junior medical officers. There are many lessons for health services looking to join the growing connected network of Choosing Wisely Champion Health Services who are willing to collaborate and share their experience and learnings for adaptation at other sites. Whether through grand rounds, departmental presentations, orientation or intranet materials, these conversations have sparked a refreshing degree of support from busy hospital staff. Lasting culture change will require the commitment of both individuals and organisations to ensure that every conversation is one that promotes value-based health care. Dr Kitty Yu is a qualified pharmacist and has a PhD in medication safety. She has an interest in the implementation aspects of e-health and quality use of medicines. Dr Matthew Anstey is a specialist intensive care physician at Sir Charles Gairdner Hospital in Perth, WA, and the current chair of Choosing Wisely Australia Advisory group. Joseph Cuthbertson is Regional Clinical Risk Management Coordinator at WA Country Health Service (Wheatbelt) where he is a clinical lead for their Choosing Wisely Program. Asmara Jammali-Blasi is project lead for the current Victorian Choosing Wisely Collaboration. Asmara has worked in health research, epidemiology and project management. She’s a registered nurse and has an MPH and an MBA. Angela Melder is an expert in evidence-based practice, and leads a team facilitating clinical and operational teams at Monash Health with the translation of evidence to inform evidence-based decision making. Jessica Toleman is an experienced hospital and community pharmacist. She is currently Acting Executive Director at the Royal Brisbane and Women’s Hospital and supports the facility’s Choosing Wisely Program as clinical lead. Dr Robyn Lindner is a Client Relations Manager at NPS MedicineWise and has led the introduction of Choosing Wisely in Australia.